If you don’t know how to properly thank someone for being a top friend, Facebook thinks it has the answer. And it means your newsfeed is probably about to get inundated. In the wake of its successful “Look back” videos last year, which took users on a trip through their Facebook memories, the social media giant has launched a new “Say thanks” video creator. Users choose a friend, select from one of two different themes and choose photos from their Facebook page that best celebrate the friendship. 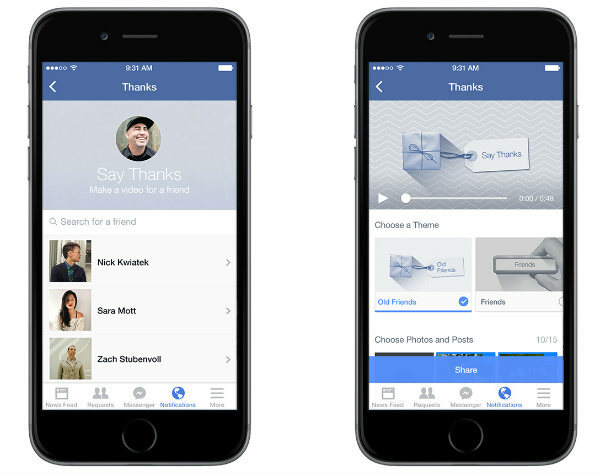 Facebook then puts together a video, which can be shared with all friends or just the friend featured in the clip. You’ll also be able to write a personalised message to the friend before posting – and create videos for as many friends as you like. Say Thanks – released just before Thanksgiving in the US – is available on desktop and mobile in English, French, German, Indonesian, Italian, Portugese, Spanish and Turkish. Take a look at a demo of the new video cards below – although we predict you’ll soon be seeing plenty of them in your newsfeed, if you’re not already.